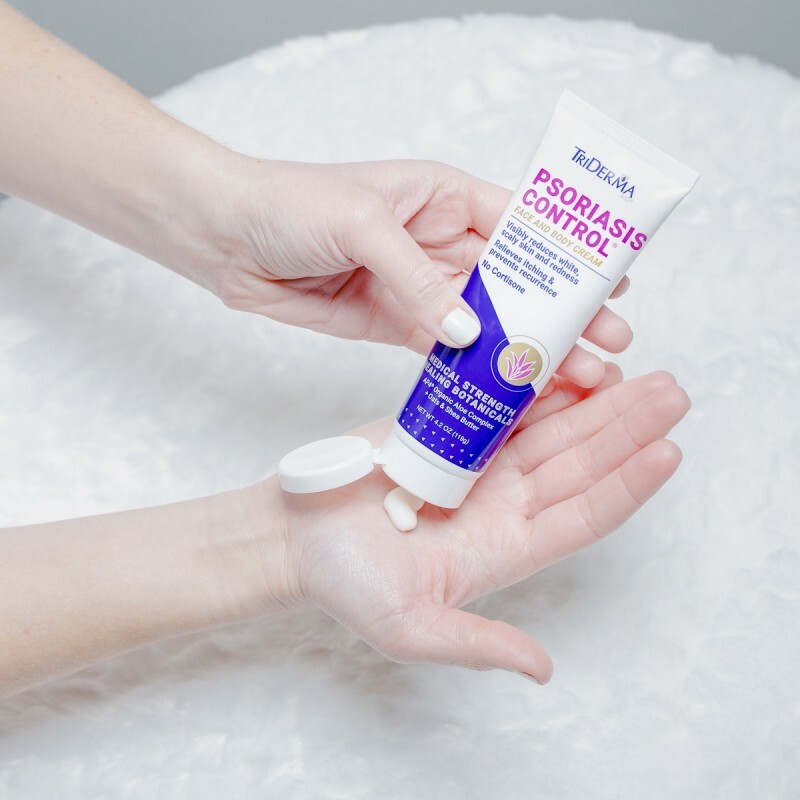 Psoriasis Control® helps promote fast acting relief for red, ﬂaky, scaly skin, white dead skin cell build-up, extreme dryness and itching. This non-greasy cream contains specific healing ingredients to help the appearance of Psoriasis symptoms. Daily use helps prevent recurrence due to Psoriasis and seborrheic dermatitis. Want to know more about psoriasis? Check out these blog resources! I’m using this and already after day one I see a huge differences. It burns a little but my psoriasis is so bad it’s to a point it is raw. So I’m grateful I found this! Nothing heals my psoriasis but this product has helped control it better then any other tried. Triderma is heaven sent and a blessing to me I have my life back, thanks I'll continue to buy your products forever. After do it yourself crap, I finally looked deeper and found the last box on the shelf. Detergent rash went wild in bikini area and after first application noticed difference immediately! Now my radar is on All your products. Thanks. I started having red scaly spots on my check and chin about 5 years ago. I have tried countless moisturizers and the scaly flakes come back within a couple of hours. The first day I tried this product, I went the entire day without picking at my face. I am amazed and excited to try other products. I decided to try TriDerma Psoriasis Control cream after seeing it on the store shelf. I used it for 3 weeks as per the directions and I now have very minimal scaling, no redness and no itching. I still apply it every day and it works! Thanks for a great Product! It burned until my eyes watered, but after 3 minutes that subsides and it was very helpful. I have tried so many products, can't believe I waited so long to try this one! Found TriDerma for Psoriasis at Walmart about a year ago while searching for a product to relieve the scaling and itching of psoriasis. It is the best over the counter product for psoriasis that I have found. Would not be without it! I do not like to use topical steroids. My dermatologist approved when I informed him of this product. Thank you TriDerma for this wonderful product! This Is one of the best products I ever tried on and the results were the best for me. It's fast-working, it's affordable, it's convenient and easy. It goes on easy and doesn't leave me feeling sticky or greasy. This product works wonderfully for my psoriasis. The best part is that I don't have to worry about using products with a bunch of steroids or getting painful injections. I told my dermatologist about it and she said she would rather me use this product than any pill or steroid product. No side effects either. I suffer from psoriatic arthritis. When I go into a flare usually its on my scalp, my hands and my knees. So ive tried other products but none helped. Recently I bought this product (Triderma Psoriasis control) and I must say its completly amazing. My psoriasis cleared up in 2 days! No more itching or burning and no more scales or bumps on my scalp. I am so happy I bought this product it is so worth it. I started using this product a few years ago and love the way it works. The store that I normally bought it at stopped selling it, so I tried a couple of other products. I never got the same results as with TRIDERMA. Happy to say I found some today and it even had a bonus travel size with it. Thanks Triderma ! I can already feel the healing starting! I love this product and have recommended it to many people. I have been using this product for a little over a month now and it has shown great results! Redness had gone down and looks so much better. I am starting to feel comfortable again. I'll definitely recommend this product! This product works well for my daughter. I have taken her to multiple doctors we have tried so many different medicines and creams, this product is the one that helps her the best. Works really well. I've tried many other products and had several prescription medications over the years and this one works the best. It really helps with my flare ups and helps me keep my Psoriasis under control. this is the first product in lotions/cream that I have tried that works like it says....relief upon first application, use in morning then in evening...will buy again! I bought this for my husband. He has been fighting with his psoriasis for a few years. Nothing that his doctors have prescribed helped, so I thought we would try this on a whim. WOW, it has really improved over the past few weeks. I will recommend this to anyone that has psoriasis or even knows someone that has it. Very pleased!!! Scaling skin on feet, hope this product will work. Cracked and dry scaling skin.Just purchased this product, will update after use. Maybe I need a different product, but I am willing to give this a try. Will research other products listed to see if I am using the right one. Please advise if I should be using a foot cream for cracked and scaling skin. Location: Elbows, leggs & Back. Great Product**Maybe make it Stronger !!! Maybe use a 5 to 10 % solution to make time go quicker. My elbows use to be so dry and my mom recommend Psoriasis Cream so I started using this and it workes great! By applying daily shrunk the spot until it disappeared. I usually have to apply more in winter. It also doesnt always absorb into my skin very fast so I feel it throughout my day if I rub something. Great product! Keeps my skin moist. I've tried so many different drugstore brands over the years, that are supposed to help relieve the symptoms of psoriasis as well as some prescription strength treatments.Not one has made a difference the way that TriDerma has. Plus, it's only been 3 days! I wasn't expecting much from something OTC and probably wouldn't have given it a second thought if I saw it on the shelf. The online reviews are what swayed me to give it a try and I'm so glad that I did. It has stopped the white scaling, soothed the redness and raised appearance, and stopped any dry burning/itching sensations. I also love that its formulated for face and body because it is a truly non-greasy formula. My skin is on the normal to oily side and any moisturizers that are too heavy tend to turn me into an oil slick. That was not the case here. Please give it a try. I promise you will not regret it and, as mentioned here previously, if you purchase at a big box retailer, the price is less than half the price as listed online. I have tried other lotions and nothing worked until I used the product. I'm thankful I found this lotion. I used to use Gold Bond Psoriasis lotion but the price has increased and I decided to try something different. The ingredients for this seem to be the same but it is a much lower price. I have just started using it so I am not sure how well it works quite yet but it doesn't really have a smell and it hasn't left my skin feeling oily like many other products have..
After years of using the same ointment that left me feeling as though I had just stuck my hand, and my elbow, into a oil barrel, I discovered this cream. I've only been using it a week and I already see improvement! My physician even noticed and asked me what I was using. The best thing is its all-natural roots, which is very important to me. I highly recommend. I'm so glad to have found this. It does a great job in eliminating scaling and itching on psoriasis patches more than a decade old, it leaves no grease stains on fabric, and it has no nasty odor. That it's also cruelty free was the reason I bought it in the first place, and I thank the company for taking that important stance. Has healed up my skin & I also suffered from Keratosis Pilaris on the back of my arms, ai used this there as well & every last bump was gone within a week. AMAZING! Just purchased my 2nd tube today. I did purchase it at that really well known Big Box retailer & it was much less expensive from them. Just a tidbit that might help some of you out. I would however order at the Triderma sure price ignored I couldn’t get it elsewhere b/c I’m thrilled to have found something that actually works! Helps a lot to heal my psoriasis. Thank you so much !!! It takes away the scaly patches and keeps them away. After using this product Psoriasis Control it started taking away my patches which made me so happy because it was gone for a long time while going to tanning bed then weather changed and had 2 babies and it came back FULL FORCE!! THANK YOU FOR THIS PRODUCT. It took a little while for it to start working, but once it did, I no longer have scaly skin! My itching isn't as near as bad as it once was either! No more hydrocortisone every single day! I still itch very little on some days, but overall..... Great job Triderma! I really like this product. I use it every day after my shower and definitely helps to keep my psoriasis down. I was very afraid to purchase product do to all other products I had purchased over the years! But I am glad I did because first day I started noticing a difference! Will keep using product and can’t wait to see all it will do! Thank you for this product! I have tried many different lotions to control my psoriasis and none have worked. A friend suggested I try TriDerma. This product started working after the second day. Although the redness is still there also, it has gone down quite a bit. Occasionally I will use it on my feet as i have this condition there and it works very well. I would definitely recommend it to others and I will be buying again. Relieved my itching as soon as I started using it.My skin started healing within a week.This is an excellent product and I would recommend it to anyone suffering with this condition. OMG before discovering TriDerma it was awful, now my skin looks 100 times better thanks to TriDerma's Psoriasis Control cream. I use it twice a day sometimes I do miss my evening application which is okay from time to time but I put it on first thing in the morning. My skin could not be happier thanks to TriDerma! I have been fighting Broken hurting Itchy skin on my hands forever and have Tried alot of lotions but none have worked till I found this one now it keep my hands from getting so bad that they hurt to move them loving this cream for my hands it really works!!! The product really works, high quality specially because it is free of cortisone and has organic aloe complex. You feel how it helps to control dryness and itching. I definitely recommend this product. I have been using this for only a week now but I have seen some results. Moisturises quite well, no medicinal smell, little bit of burn sensation but it goes away in less than a minute. Gets red at first but it goes away in minutes. Overall I like this product. It controls the scaliness and redness from my psoriasis. This product absorbs right into the skin and there's no greasy mess. I bought this product for my husband. Within a few days he could see a difference. I gave 4 stars because we could see results. I'll give 5+ if it takes the psoriasis away. This is a miracle cream. My teenage daughter began getting flare ups of blotchy dry, red patches on her face around puberty. The doctor wasn't concerned considering her age and hormones, but it has continued to get worse, and added hot, puffy inflamed cheeks to the mix. He checked blood work to rule out any inflammatory conditions, which came back negative. She's 15 now and athletic. The activity in addition to cold, heat and wind really flare up her face. We purchased the Tri-derma psoriasis control on a whim, after trying other calming creams, natural treatments, and whatnot. It has helped immensely with the blotchy dry scaliness - I suspect that is primarily the salicylic acid; the aloe and botanicals keep it soft and moisturized. She liked it enough to ask me to buy it again, which I have. Unfortunately, though the label indicates it should help calm the redness, it has not. It does in fact make her face bright red for about 30 minutes after she puts it on. It calms down, but it does not keep her from flaring up on a daily basis. Its not the whole package., but it does help with the dry, flaky patches. I'm considering trying the rosacea repair to see how that goes. All things considered, its the best product we've found so far. I needed something for my lupus. This over the counter cream works wonderful. My husband's knuckles and elbows looked like he had thick white callouses on them. He would scratch them and they would bleed. His doctor gave him a prescription that was incredibly expensive and he was told not to use it too often. I use the excema healing cream and it worked miracles for me. When I saw this cream, I took it home for him to try. It provided almost immediate relief and in about 3 days the white scale was gone. TriDerma makes excellent products. I recommend them to anyone with skin problems. This product is, of course, not as good as prescription medicine; but it has helped with the redness and the itch. I just wish I could get it in a larger amount as I seem to go through the tube too rapidly. I have had psoriasis for 30 years and have tried many over the counter product. This is by far the best I've ever used. It helps heal and moisturizer the dry, cracked scales almost instantly. I have used this product for a couple of weeks now. I love it! My skin looks clear. There is no more itching. Thank you for creating this!!! I just got this product 2 days ago and I can already tell the difference in my psoriasis and my dry skin!!! I am amazed!. I have been battling Psoriasis my whole life. With this product I have finally found a skin lotion that soothes the itching and the pain from dryness. I would definitely recommend TriDerma MD to other customers!! I have psoriasis on my hands and feet, struggling all the time to find different products that work. Triderma has noticeable improvement right after using! It's something I always use and will continue to use for combination therapy! I have tried MANY types of lotions, cremes both OTC and prescription and nothing works as good... most actually made my skin worse! I have noticed sometimes the salicylic acid crystallizes out but, whatever-- it still works!!! Thank goodness!!! I have suffered from scalp psoriasis for over 10 years. The itch is so intense at times and it wakes me at night to scratch. I have prescription medicine but I prefer not to use it all the time because of the ingredients and side effects associated with them. I found this product today while shopping in Wal-Mart and decided to give it a try. There is one particularly itchy spot on my scalp that flares up frequently. I tried it as soon as I returned home and so far it has relieved the itch for over three hours. I am very thankful and plan to continue using it. I am hopeful that I will see great results like so many others have attested to here! 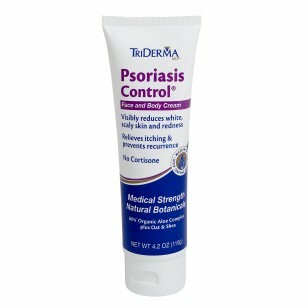 TriDerma Psoriasis Control cream is a wonderful product. I am so happy I found it. Used this product and within a week the problem is almost gone. Fantastic product! I Bought the tube 2 weeks ago and my hands have not been that bad at all. The improvement was noticeable and if I miss a day it shows. i have suffered with this condition on my left wrist for over 2 years! i have been to 3 Doctors and many prescriptions.This has controlled the itching , scaly white patches and redness.in 3 weeks my arm looks almost normal! thank you TriDerma ! Have battle my skin for years, tried everything on market. This product WORKS! Took almost a week to see visible difference however the itch feeling tone down within a day. I purchase this for my husband who has psoriasis really bad, especially in the winter. He has prescription ointments but prefers this. He says it does a better job. My grandson has some form of eczema and has tried the eczema control but says that the psoriasis control goes on easier and works just as well for his red itchy patches. They have been using this for several months now and both like it. I usually purchase it at our local Wal-mart. Thank you for a great product. I have tried many products, this works the best of any I have tried. I have suffered for a few yrs with scaly rough skin on my head and face, but as soon as I applied to this cream it felt like heaven, instant relief. I've had to get shots as well as use 4 different types of medicated hand creams on a daily basis prescribed by a dermatologist. none of it did any good. this hand cream works perfectly and keeps my hands from splitting and bleeding and getting scaly. and I can buy it when I need it over the counter without getting ripped off by a dermatologist. This product took away the itchiness and made my skin feel soft! I just recently purchased this cream and it works awesome!! Love it!! Fast absorbing, doesn't stink, natural! I've been using this cream for several years. After trying many over the counter creams that did nothing and prescription creams that worked wonders, but were expensive and temporary, I found this product. It alleviates the scaling patches and soothes my skin instantly. I have to be diligent and use it at least twice a day, but it is fantastic. I hope my local Walmart never stops carrying this product. I've been fighting this dry itchy skin on my arms for a long time, and same across this wonderful product. It isn't greasy at all, and I personally had almost instant relief of the itching. It has also cleared up alot of the redness and dry skin. Will definitely buy this from now on. About a year ago I began to experience psoriasis symptoms. Patches appeared on my forehead and around my nose. I bought this cream hoping it would relieve the itching, scaly skin and redness. I was amazed at how my skin began clearing up within days. With regular use my skin looks symptom free. Thank you. As a side bonus, since I apply it to my entire face, it has replaced my previous facial moisturizer altogether. My face looks and feels great. I've only been using for less than 2weeks, but my arms are noticeably improved. The scaly white spots are gone and two large lumps have shrunk. I did notice though that it is right back if I skip a day. I loved the results! No more itching the redness it going away and leaves my sores soft and tolerable..Ty for such an amazing product! I've had eczema for about a year an I feel like I've tryd it all trying this an I can already see results. Best thing I've ever had!!! Haven't seen any improvement in skin condition but helps relieve itching. I purchased this cream about a week ago at Wal-Mart and so far i've seen results already. I hope this product continues to produce results and im sure it will. I love that theirs products for all ages and conditions, very pleased. For the past few years I have developed thick psoriasis on my hands and feet, which tends to flare up more during the change of seasons. I was trying every lotion I could find to try and put a dent in my thick flaky feet. All I found were water based oily messes. Then I found Triderma Psoriasis Control. I admit I was skeptical. "If it was so good and could do what the box says, then why haven't I heard about it?" As a last ditch effort I shrugged my shoulders, grabbed the product and hesitantly made my purchase. WHERE HAS THIS PRODUCT BEEN THIS WHOLE TIME?!?! I put the cream on my feet and instantly the itching subsided. It's been a week and already my white flakes are diminishing and the thickness is softening. I apply twice daily. And wear thick socks to hold in moisture (but not needed, just cold in MN lol) I will be buying more Triderma to help with the flare ups. I'm so thankful that there is a product that works! I would recommend it this product for psoriasis without a doubt. This product relieves itchy flaky skin and is affordable. I can honestly testify to this product. If you use it on a consistent basis it works just as well as a prescription. I’ve had psoriasis since I was 17 years old. This stuff is cheap and very effective! It’s my go to during a flare up for sure! To start off with "I have tried everything for my skin condition which is contact dermatitis.I love this product." I constantly check in skincare area in walmart supercenter for new relief products. I' m allergic to everything and it effects me by rashes ,itchy ,dry, sometimes painful whelps.It's non stop,my arms and leg look just as the picture on the box did. That is why I purchased the Triderma Psoriasis Control .It stated within 10 days it would clear up the redness and itch and dry skin. On 12/23/2017 I purchased the product ,began using it the same day every time I itched also I would apply.As of today 3 days of use my skin does not have the dry flakiness,the redness is fading,its lightened up the damaged area.I will continue to use this product. I've already bragged on it now my sister is trying it.So thank you for this miracle cream. I bought this product for my son who has psoriasis on his hands. This has been a blessing! We were dealing with scaly, itchy, red, bleeding knuckles but this product has cleared it almost completely up! Thank You for an affordable product that works! I had broken out with this skin condition over my back,arms,and chest. I tried numerous products over several months with minor success. Then I discovered your product.Within two weeks the condition improved to the point of barely seeing the condition on my skin. I continue to use it to prevent it from coming back. I started using this about 8 weeks ago to treat my seborrheic dermatitis, as well as rosacea! IT HAS CHANGED MY LIFE!! I have gone from scaly (to the point of full blown scabs) on my nose and edge of my scalp and big purple-red knots on my cheeks to smooth, beautiful skin with just a natural soft pink flush. I apply like a moisturizer to my face and hairline every night before bed. I can not tell you how grateful I am for this product! Ive tried so many other products and tips and tricks and have always been so disappointed... until now. I feel beautiful and normal! Thank you TriDerma Psoriasis Control!!! Great product. Well made and definitely helps. I have psoriasis on the side of my nose and I have had to watch what I put on it so it doesn't get into my eye. After the first time trying I noticed a difference. I will never stop using this. Hubby had a red patch of itchy skin on his leg and I made him use this. Next day it had stopped itching! Thank you! I tried different products before, but none have given me fast results like TriDerma psoriasis Control. I love it! I have been going to the dermatologist for about 5 years. They gave me a steroid cream that would treat the dry area temporarily. I got annoyed with constantly going and having to get a new prescription, so I started to look elsewhere for a treatment. I've been using this product for 3 weeks and I can already tell a difference. It is so much better than what my doctor was prescribing. I love this stuff and will definitely purchase again! I have used this stuff for quite awhile now. It seems to do a good job with my psoriasis. On me, it doesnt take it completely away but it alleviates most of the issue to about 90%. I will continue to purchase it. I have been using this product over 2 weeks but not seeing much relief. I havent seen flakes or itching reduced after using this lotion. I will continue to use further to see if I get benefit over next few weeks. I bought this yesterday for my feet. I have battled over 1 year with my feet scaly an white patches and itching so bad. I have tried so many products. I can say that after I put this on my feet last night I slept all night for first time and was able to get up and walk on my feet with ease this morning. I am looking forward to continue to use this product and see how it continues to improve my feet. About three years ago, I had these terrible rashes on the back of my thighs. They were unbelievably itchy and I could not figure out what had caused it. I did the worst thing which was scratching the area and it created this awful pain and bleeding, and to make matters worse, the scabs made my legs even itchier. It felt almost impossible to never pick at it, I felt so helpless. I couldn't wear shorts, and I embarrassingly wore paper towels and wraps underneath my pants so that the fluids wouldn't seep through. Desperate to find anything that could help, my dad magically found TRIDERMA's Psoriasis Control cream (either at Kroger's or Walmart) with these helpful pictures on the side of the box. It looked similar to what my thighs looked like, so we gave it a try and it immediately worked! The itchiness faded, it slightly burned, and I could feel the affected areas healing within a day! It was amazing how much this helped. I also noticed that my legs did not scar; I'm not sure if this cream specializes in scarring but it left no trace of my tragedy behind! I’ve been looking for a new product for my skin to stop the itching because what I’ve been using doesn’t work. Psoriasis Control stops the itching and helps to control it. It fades away. Just bought this product from Wal-Mart and am hoping it works so i don't have to get prescription cream anymore. Works better than any other brand of similar product that I've tried. This stuff is great. It really reduced the redness and the itching all while keeping the skin soft and adding moisture. Was used on the face and was gentle enough to use but also strong enough to do its job. This product is really great. I have not used it to long to see the end result but within the time I have my flare up has calmed down so much. It relives my itching so much. I recommend this product for anyone who has psoriasis and is looking for something to keep it under control ! I have been using this product for a couple of weeks now. When I apply it, I get fast relief of the burning/intense itching. I also notice that it diminishes my white scaly skin to a less noticeable red tone. It is fragrance free, which is a great relief from smelling like coal tar! I have not been using it long enough to see long term results, but I am pleased with the short term ones. I love the fact that it has better ingredients and non-steroid going on my skin. I really have high hopes that this will make a big improvement in my skin in the months to come. I am so glad that I gave it a try! I stumbled on this product when looking for Calydryl. My psoriasis has required oral medications and soon, will be starting biologics (Injections), but nothing, not even the steroid cream the dermatologist prescribed for me has helped with the itching and flaking. This product is already helping to keep the itching down and keep the areas moisturized. Also, there is no scaliness when using this. Of course, psoriasis is an auto-immune disease and cream, alone, won't cure or stop it, but keeping the itching and scaliness down is a huge help. I just started the product 2 days ago and am satisfied so far, seems to reduce the scales and itching. I do wish there was something for the face that wasn't as heavy as this but it works well on my arms and hands. I have a problem with scaly skin, specially in the ears. What I would do is use a shampoo and apply some of the foam around the ear, and it would more or less clear it up, but I would have to be very careful to not leave any foam and, at the same time, get all the water out. I saw this cream at the store and decided to give it a shot. It worked perfectly and in less than 10 minutes I felt the relief. I use it at least 2 times a day and I love it. No more messing with water & foam inside the ears! I had my first outbreak of psoriasis when I was 13, and since then, I have had about 3 different outbreaks. My doctors have given different types of pills, lotions,ointments, foams, and creams, and none worked except for one foam (for gutate psoriasis) and anointment (for plaque psoriasis), both of which caused later scarring. I was given Triderma's Psoriasis Control Cream to try,and I figured "whats the harm in trying? ", and oh my gosh, am I impressed!! I put on my first coat of cream right before bed, and I woke up the next morning with the redness completely gone, and the size of my actual sores has decreased drastically. After just a few days use, my psoriasis outbreak is nearly gone. I love it so much that I bought some for my mother, and she is also OBSESSED! I would give it 10 stars if I could! This product actually works. It has to be used systematically, but you can see results as shown on the pictures on the box. It is not overly grease and absorbs quickly. Tried other brands, but like this one most. I recently purchased this product for the first time. I am happy with the way it helps with the scaling but I am not happy about the redness. It doesn't calm the redness at all. I was hoping that it would help with both aspects like my other brand Dermarest. Always looking for something to rid me of this Psorasis. I did not know this product existed. I always skimmed over products for Psoriasis. I have went to the Dermatologist and did not stick with the creams they prescribed since it didn't seem to work for me. I somehow contracted Psoriasis on my elbows, knee-caps, 2 circular small spots on my lower calf and certain parts of my face and scalp. I never stuck with anything for long but I am tired of looking around and feeling self concious about my skin. I can't even wear make-up anymore since it cakes up around my dry patches. Within the next 30 minutes of applying the cream to my affected areas, it seemed to add moisture to my patches. The downside was that my kneecaps itched like crazy!!! This happened for a few days after applying it, but the itch has decreased whenever applying. I would definitely recommend this to anyone just wanting to try something. Research shows that Aloe Vera, Tree Oil, Dead Sea Salt will help. This stuff has the Organic Aloe Vera, which is even better!! Next thing I will look into buying is the shampoo. I'm a new user but am very happy so far with my results using the cream. this is a wonderful product works great helps with my psoriasis and i've been using this product for 6 months thank you for great product.. I have tried most every product out there for my plaque psoriasis both otc and rx. This product is both gentle on my skin and effective. I cant say how much money I have spend on creams lotions lights etc and this is the only one that relieves my hands from agony. I have tried so many and keep coming back to TriDerma -My daughter works in a warehouse and Im going to make sure she tries some of your Hand products. thank you for a awesome product!!! The Psoriasis Control has worked great for my feet. I have psoriasis on my feet. The Psoriasis Control has help with the dryness, peeling, hard skin, & it doesn't have a funny smell like the tar products. Leaves my feet looking much better. For anyone suffering from psoriasis, this cream is great. I started using Psoriasis Control just 3 days ago. I did not expect to see results so quickly. The redness has gone away. The itching isn't has horrible. I'm very pleased & will definitely continue using this. My self esteem thanks you! Being a young woman, I'm very self conscious about my skin. Having thick psoriasis is awful but even after the first day of using this I can see a huge difference! And it's not oily or cakey, I love it! Visibly reduced the scaliness of my psoriasis patches and is beginning to clear them up. Moisturizes skin without being greasy too. I highly recommend this product. Only have used for a couple of days. Already a huge improvement. Cannot wait to see the difference after using it longer. So glad we tried this. I have been prescribed various steroid oils for my scalp psoriasis which would work for awhile and completely stop. I've tried several over the counter remedies as well but nothing compares to this cream. It's instant relief every time I apply it. I worried it would leave my hair greasy but it isn't noticeable at all. I've also used it on what appears to be only very dry skin patches on my one year old's body and it's worked wonders on him as well. I highly recommend!! Nice to see a product work as advertised. This clears up the redness, and removes the scaling. After applying, you can't tell I have a problem. I bought this for my teenage daughter to try on her scalp. She said that at first it was cold but then turned tingly and warm. The itching went away pretty quick. I hoping this will give her some relief and the scratching to STOP! I have tried other products to try and get my psoriasis under control with no luck except with prescription products. Unfortunately my insurance opted to discontinue coverage for them, so what to do? Tried Gold Bond and even though it worked for my husbands skin rash , it didn't do much for my psoriasis. I started having more patches on my face and arms, as a Food Product Demonstrator I don't want people to be concerned with the scaly patches. With regular use The TriDerma Psoriasis Control does show marked improvement. I make sure to always have it on hand and love the bonus small tube for in my purse. I just purchased the Triderma Shampoo for psoriasis but have not used yet. Hope I can give that a 5 star also. I've been using this product for only two days, and I do see a difference. I have tried a lot of products for psoriasis and by far this is the best one so far. I'm glad I stumbled upon it in walmart. This product does work. It took about four months before 90% of my lower legs cleared -moderate psoriasis- I applied It morning and at bedtime. I have a hard time with the greasy feel of most skin products, this product does not take forever to be absorbed into the affected area and dues give you the greasy feel.. Since 2005 none of the high priced prescribed products worked to eliminate or control the psoriasis. I continue to use it daily with very good results. This product does really well for me. I like that it's non-greasy. I got thia product 2 days ago at walmart and the scaling has already stopped. I have had outbreaks of red flaking skin on my chin and on the sides of my nose for years. I went Walmart and stumbled upon psoriasis control and figured I'd give it a shot. When its first applied, it burns a bit but then it seems to feel better rather quickly. I've only applied it 3 times and it's worked great so far. I'm really glad I tryed Triderma!! At first i thought it was just going to be oily and uncomfortable like most. But i was surprised when it absorbed quickly still leaving my skin feeling soft and moisturized. No slimey oily feeling at all...awesome! I stumbled upon this product and I thought I'd give it a try. I have tried everything under the sun, no pun intended. I figured why not, figuring it wasn't going to work but why not. Boy was I wrong!! The first night I applied it, the scales started to fall off!! I have been battling plaque psoriasis for almost a year, on the arches of my feet, so badly there days I can't walk, and when I can, I have to wear slippers. I haven't wore shoes since before Thanksgiving of 2016. Your product is amazing!! I have been on numerous prescription creams, oral medications and injections and nothing has worked as great as this! I will be spreading the word and in the future ordering other products off this website. THANK YOU SO MUCH!!! I'm finally able to wear my shoes and sandles again!! I love the product , it makes the itching stop and removes the scales off my head. I would recommend it to anybody with bad cases of psoriasis! I get thick plaques on my elbows that are so itchy and causes pain to bend my arms. I scratch until my skin is raw and bleeding. Psoriasis Control helps with the itching and thickness of plaques so I can bend my arms without pain. Not only does it work better than the ointment my Dr prescribes, it is cheaper than my prescription copay. I recently purchased this product without really having any big expectations. After showering, I applied a small amount to the problem areas on my eyes and chin. I can promise that the product worked instantly. I've tried so many other moisturizers, healing balms, etc... but nothing seemed to work. The patches have been on my face for several months and the itching, dry scaly patches are gone. Just so happy and relieved that I finally found a product I can rely on. Thank you. I suddenly developed Psoriasis within the last 3 months. I get red, dry itchy splotches all over different areas. I tried oatmeal soaks, epsom salts, tar soap and ointments plus prescription hydrocortisone cream and nothing was helping. I was at my local Walmart and saw Triderma's Psoriasis Control cream and thought I would give it a try. I put this cream on the areas and the itching stops and the redness fades. Some areas have even disappeared after using for a few weeks. I would recommend you try this cream and see if it works for you. At least now my friends and family do not think I have fleas or laid down in patch of poison ivy! I really like how it makes my skin look normal. I just wish we can find a cure for it to make it go away. I recommend this product to any one that has psoriasis. Thank you. Bought this product as the one recommended was unavailable. Lotion eased the itching, smoothed skin, and reduced redness. Appreciated the travel size included to carry wherever I go. Triderma Psoriasis Control is an excellent product. After just a couple of application the redness and scaliness are almost gone. Try it, you will like it!!! This product absolutely works! From red and scaly to normal color. Although still scaly, it is greatly reduced. On my second tube, hopefully this will do the job completely! My white scales were gone after first application. I've only been using it for a week, my skin looks more healthy every day. Wonderful product!! Have dry patches of psoriasis on arms, legs, and torso that are not only not scaly anymore, but they are smaller and less red!! Woohoo! I have small psoriasis patches on different parts of my body. I started using this product and did see some improvement only if I am applying this product on a regular basis. the only problem I am having is I scratch a lot and need to work on it, overall it's a good product. I have been using this product to control my Psoriasis on my knee and my 2 elbows. I have used for several months and I am very pleased with the results. It is not as scaly and the redness has gone away and my itching has been greatly reduced. If I don't use for awhile I can notice the difference. I am happy with this product and will purchase again. This is the second time I've tried the product I like the moisturizing quality of this product the psoriasis control cream it only slightly conceals my redness but seems to be a good product. I just started this product and I am excited in the noticeable difference. It goes on great, not greasy at all. I have been prescribed ointments from a dermatologist and the side effects are horrible. I do not have any side effects from using this cream. Thank you for a wonderful product!! This is not only something that makes me feel better but something I can actually afford. I just happened to notice this product on the shelf, was lucky to see it. I got a bonus tube, perfect for my purse, and I used it today while I was at an appointment waiting. My skin was itchy and I felt immediate relief after applying. Will buy this product again!! Impressive! In the first application I already felt the difference! Fantastic! I'll keep using it to see the progress! After using this product, my skin conditions have greatly improved. I use it after every shower, in addition to, as needed throughout the day. I've noticed a significant reduction of scales, bumps, itching, allergy related skin symptoms, and possible psoriasis. After a couple of weeks is when I noticed the huge improvement. Thank you for making such a great product that's over the counter and at a reasonable cost! Just started to use, some relief from itching. Working on redness. When I was around 7 I had to see a dermatologist for the spots and flakes I hadon't on my skin and scalp. He prescribed me this liquid to take every night with a fatty meal. I dont remember exactly what it was but I do remember that it tasted horrible and didn't work for me. Eventually I stopped using it and due to financial issues I didn't go back to the dermatologist. My parents did, however, purchase different shampoo brands such as head and shoulders (generic) and t-sal. These didn't work either so we gave up and let it be for a while. Over the years it subsided and then recently it's resurfaced worse than before. I have scaly patches on my scalp and face as well as occasionally on my neck, legs, and arms. I tried a dermarest gel product to calm my skin but it only worked slightly and smelled bad. Naturally I wanted something that would work fully. Upon browsing the tiny section relating to psoriasis and eczema, I came across triderma. I figured I might as well give it a try, especially considering it is cruelty free, women owned, and has no harsh chemicals. I'm so glad I decided to try this product. It's been about a week since I picked it up and already the flakes and redness are controlled better than ever before. I'm thankful to have found this brand and look forward to trying other products from them in the future. I have been prescribed 3 creams and nothing worked for me. My cousin told me about this product and I love it!! Took the itch away fast!! I saw excellent results just after two days. The itching and scaling disappeared. Definitely recommend it. I saw visible improvements after just two days of use! I just bought this product at Walmart for my psoriasis I was diagnosed with Psoriatic Arthritis 4 years ago. The dry skin patches just started to appear this year. My specialist recommended trying this product first before having to prescribe a stronger cream as I also have sensitive skin. I tried Psoriasis Control from TriDerma and viola as my Arthritis specialist recommended and what an improvement and not burning to my sensitive skin at all. It provides immediate relief from redness, itching and scaling. I HIGHLY recommend this product! great product, controls the itching. I brought the product about a month ago. After the first day of using it, I saw results immediately. I have been suffering with this for years. In and out of doctor's offices. This product "Rocks"
I just got this product from the store. I've struggled with psoriasis most of my life, and it's primarily on my face and ears which is really embarrassing. I've tried topical prescriptions and they always burn when you put them on (even if they work). They're too expensive for me so I was recommended this product from my mother in law. It didn't burn my skin when I put it on and that was really exciting to me. I look forward to seeing some results, even if it just makes my skin not hurt so much. First of all, the person I spoke to when I called into TriDerma was so concerning and very very caring in understanding the issues. My grandson has eczema and i asked at Walmart, the pharmacy dept, if she had any ideas. She, Tory, was amazing and said her daughter has it and that this works wonders. She also has tried everything! It is so safe and my heart can not hurt so bad in watching him itch with red hives/places. Thank you SO much~! Product seems to diminish the redness, itching after a few applications - very satisfied. Like the idea of an OTC product instead of RX. Have tried prescription meds, samples from doctors, etc and happened to stumble on this at Target. I couldn't believe how much better my psoriasis patch was after just 2 applications. Bought a 2nd tube to keep in my purse. Great product will continue to buy! My Doctor told me about this product. He wanted me to use it along with the medication he had given me and I procrastinated buying. I am so sorry I did. I used it for the first time last night and right away I saw a difference. The white scaly skin I was use to is now starting to turn pink and the cracking and burning is not there and it doesn't itch. It's a very good product. Soaked right in and removed scales and redness almost immediately. Very happy. I love this cream! I put it on my face and the next morning all the redness was mostly gone! I can't believe how fast this worked for me and I am highly impressed! This wont be the last time I buy this! This cream gives me a great barrier against the elements. It breathes well and doesn't have an unpleasant smell. It absorbs well without being sticky. So far so good. This is my 1 star week of using however very pleased. After using the product for about a week, the scaling, redness and other symptons have been reduced. I will continue to use the product and see. Great product, no oily residue and no smell. Product works just great. I have seen drastic improvement to my skin wherever this amazing product is applied. The fact that it's OTC and made with botanicals is just icing on this delicious cake. I really appreciate the non-greasy texture. Unlike coal tar products, this one doesn't smell bad. It doesn't really have a smell at all. I have tried many over the counter creams/ointments and was about to give up until I came across this cream at Wal-Mart and I am glad I tried it! I have moderate psoriasis mostly on my back & lower legs. It immediately provided instant relief of the itching I had. I have been using it for only about a week and already has improved the redness and the flakiness from any "scales" I had is already gone. It is not messy ..non-greasy and unscented which is a plus. So far so good! My husband has Psoriasis in his scalp. We have tried EVERYTHING !!! Just by chance I pick this product up in Walmart. I am telling you it has given him more relief then anything. He still suffers from iching scalp but at least half as much if not more. I have suffered with Psoriasis for a few years now and thought that the only options were products that had a strong odor. I was pleasantly surprised after using this product, that it works well to control the itch and scaling and does not have any unpleasant odor! Thank you for a wonderful product. The free travel size is fantastic to take to to the gym. I've tried several OTC creams to control the scaling/itching of my face and reduce the redness. Gold Bond is too greasy and really doesn't do much, and the rest do a so-so job (temporarily) but just too expensive. I saw this today and thought I'd give it a chance. It doesn't feel as greasy as Gold Bond and doesn't burn as much as others. I also like the fact it's made with natural botanicals and not tested on animals. I tried another product with the same active ingredients but that product was more oily. I have used this product for a while and I am satisfied. I love this cream! It has helped heal my hand and I'm not as self-consciousness. I been suffering from pulpar psoriasis in both my hands for several months. I have used cortisone based creams and what not and still have some issues. I tried this cream and I started to heal in days! I've tried nearly everything to clear up my dermatitis, and this is the only thing that really seems to help. I had dark red scaly patches and this cream cleared them right up and provided my skin with adequate moisture, highly recommended. This lotion is applied after bathing or when I use the pool. It moisturizes and calms the red areas. It is one of the best lotions for controlling the dry itch that can develop. I love it! I have psoriasis which was finally diagnosed after 20 years of going to different Dermatologist. I was prescribed cortisone ointment but I could only use it for 2 weeks. I found this lotion at Target and tried it. It does not get rid of psoriasis as there is no cure for it but it does help great deal. I would definitely recommend this. I just bought it today, I was on prescription steroid cream. But when I read that it can cause skin thinning. I didn't want to use it anymore, it wasn't clearing ,or relieving my itching and redness. So I bought this Psoriasis Control, and started using it today, I'm pleased because it has helped with the itching and scales. I'm gonna keep using it . I look forward to seeing how well it will work for me. My dad suffers from psoriasis and has been given different meds by his doctor. He found a tube of Psoriasis control lotion for face, body and scalp by Triderma. The tube he bought is not on this website but is made by Triderma for psoriasis. He applied the lotion and got almost immediate relief. It works for him much better than what his doctor gave him. I bought a similar tube for my son which will arrive soon. I have tried many OTC creams and ointments for my psoriasis. I have been using this just a short time, but the relief is awesome. The product is the only one I have found to control and heal the Psoriasis. My hands look normal now. At my job, I'm constantly subjecting my sensitive hands to juice and liquids which tends to make them very dry and itchy. They'll flare up and if I don't have work off at least 3 days, they won't become any better. My mom brought home this cream one day and I was hesitant to try it because when I was younger I was diagnosed with eczema so it seems pointless, but every time I use the cream I stop feeling the urge to itch. Hopefully it'll heal me completely. First cream of many that have actually calmed the itch and helped heal the large cracks. I love it!! I found this on the shelves of my drug store and decided to try it out. It has helped quite a bit with the scaling on my arms and other dry patches on my body. I use it a couple of times a week because my skin tends to get used to products that are used regularly. In the past 10+ years, I have used every OTC cream I could get my hands on, not to mention 5 different Rx creams. None of them made any difference at all. I have spots between my eyebrows that bled constantly because of ingrown hairs. I have become a recluse, afraid that people might think I was contagious. I found this and for some reason decided to try one more thing... I thank God for Triderma!!! I was expecting it to take 2 or more weeks before I may or may not see a difference. After only 2 days, the bleeding had stopped and the dry flaky skin seemed to just disappear!! If I skip more than 3 or 4 days, I notice the redness starting to come back, so I wash my face a apply! I use it most nights and a Bonus is that it seems to exfoliate my facial skin as well, so no more rough stuff for me! I bought this product 2 days ago and so far it has made all the scalyness almost go away. I have ppp (polsture planters psoriasis) of the hands and feet! Very painful I couldn't even use my hands hardly anymore they would crack and bleed my feet hurt to walk on and now I can actually make a fist again and pick things up without hardly any pain and it doesn't hurt to walk on my feet anymore. This has helped a lot I'm glad I found it at Walmart! I'm only giving it a 4 because I just bought it today, but I like it so far. I put it on and it burned a little at first but that didn't last very long. I like how it absorbs into the skin quickly and isn't greasy at all. I am happy with it so far and I'm sure my opinion will change to a 5 star review with time. I've been using this for about a month now. and it has greatly helped to control the redness , itchiness and scaling. The thing I love the most is that it is not greasy or slimely! I will definitely continue to use this product. I've been using the Psoriasis Control for about 3 weeks and I'm already seeing amazing results! I love it and have already recommended it to several other psoriasis sufferers! Ty again Triderma! I've always had bumpy dry skin on backs of my upper arms, diagnosed as keratosis pilaris. I've tried every prescription for this condition and nothing has ever worked. I bought Psoriasis Control because I'd heard it worked on scaly elbows. It not only cleared up my scaly elbows but I figured out by accident that it gets rid of the keratosis bumps as well! This is the clearest my skin has ever been! Feels like a miracle! I never had a problem with itchy, red, scaly skin until after the age of 30. Since becoming 30 years old, I have had itchy, red, and scaly, patches of skin on my face, especially if I have not shaved my face for anywhere from 2-3 days. This product is extremely fast and very effective. I usually can tell if my skin is starting to get a little red I will put this cream on every 4-6 hours and the redness is noticeably reduced, if not completely gone, within the first 24 hours of using it. I would recommend this product to anyone who experiences these types of issues! Love it! PSORIASIS CONTROL CREAM WORKS GREAT ON MY HANDS WHERE THE ECZEMA/PSORIASIS IS THE WORST. STOPS ITCHING AND HELPS SKIN HEAL RELIEVES DRYNESS. LOOKING FORWARD TO USING OTHER PRODUCTS BY TRIDERMA. The 3% salicylic acid in Psoriasis Control keeps the dry, scaly, plaque patches off my hands, knees and elbows. If I remember to use it at least 4 times a day (you only need a dab) and rub it in good, then the plaque does not build up and then crack. Psoriasis Control works fast and within a couple of days my plaque is under control, it works FAST. I keep a tube at work, in my purse and two at home; one in the kitchen and bathroom, so that I always have Psoriasis Control ready to put on my hands after they have been in water. I recommend this product every chance I get. I have just found this product and it seems to be doing the job. I have tried many things to help treat and control my psoriasis. This by far has help my skin more than prescription cream. I love it and would urge you to try your self. This cream lotion seems to ease the scaly, dry skin on my scalp that comes and goes. This size will last a long time as you only need a little, so it's economical too. I love this it really helps me with my skin. Ihad a bad spot on my back use the cream and its gone. I wish I would have found this psoriasis control lotion sooner! Immediately sooths itchy dry spots and almost clears them completely up after just a few days. Really works great! I've been embarrassed about my psoriasis for a decade, and never thought anything would be strong enough to cure how severe mine is. I spent a few bucks at Target on campus, and am so happy to finally have relief. So lucky to have found this product! 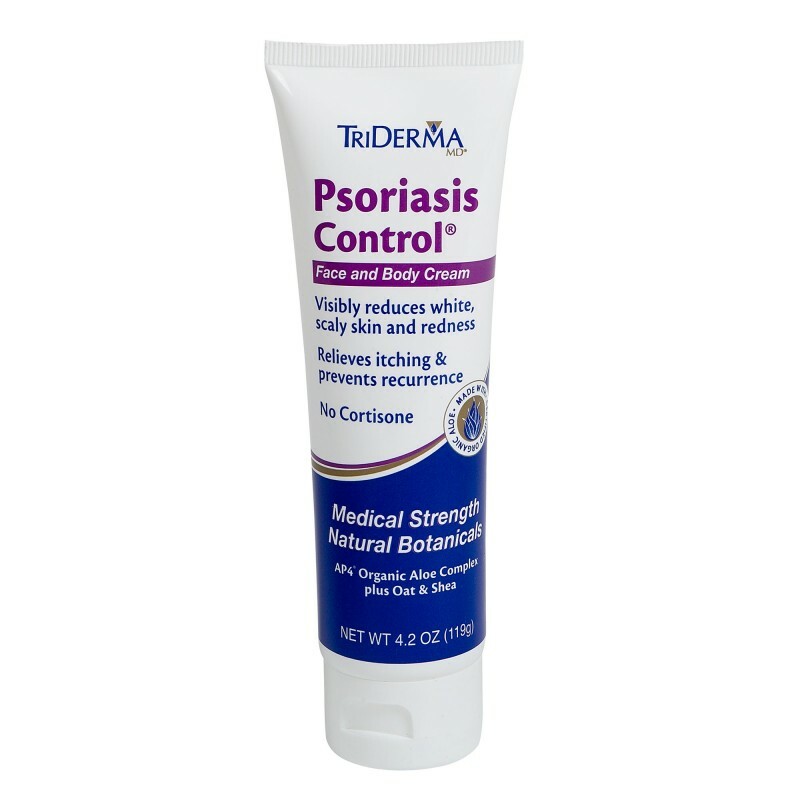 I have tried many different ointments and creams for my psoriasis, some made my problem worse, others smelled so bad I just couldn't continue using them (coal tar), and then I was introduced to Triderma Psoriasis control! I was skeptical at first, I thought this will probably end up being like the others but what do I have to lose. Let me tell you it was the best choice of my life. I purchased this at my local neighborhood Walmart, took it home and put it on, quickly the itching stopped, the irritation was gone, the next day after I had just shower the flaking skin was gone. My skin was not irritated, or itchy. I felt alive again. Triderma and everyone who works for this company, you have given us a product that truly changes lives. Forever grateful I am, and a forever loyal customer. Thank you. I have had psoriasis as long as I can remember. I have gone to the dermatologist and nothing worked. I have used this for 3 days now and I have noticed a huge improvement! My spots aren't as red and the scaly skin has decreased so much. Hello I have been using this for years now. After I had my son my facial skin started acting weird. Then I found out I have Seborrhic Dermatitis . I tried several different medicated creams. Others have left a burned feeling upon application. This one I have found works without the burning feeling. I have noticed that I have to use this at least once a day...usually in the morning. If I don't my face gets red irritated and scaly. I use this underneath my makeup as well as my moisturizer first. As I note of caution do not accidentally leave in the car in the summer. I did by accident and it was not a nice consistency afterwards....super runny. So keep it in a cool place. All in all a great product and a really great deal with the bonus tube. I usually keep it in my purse. However, this last time I got the box home and someone had stolen the bonus tube out in the store...So check the box 1st to make sure the free tube is in there. I have had psoriasis for several years now. I have tried many things including prescriptions. This product is helping already and this is only day 3. I can't wait to see what will be in a few more days. Wish I Knew About This As A Teenager! To think that I had this embarrassing scaly skin as a teenager and now 35 years later I discover, Psoriasis Control. I've been using this product for the last 2 years on my face (T-Zone) and ears and it has not failed me. Works under my foundation, as well. Problem solved. Love It!! I bought this product two weeks ago and after only three days the improvement is nothing short of AMAZING!! Gone are the scales, itching, white spots and rough spots. My dermatologist wrote me a prescription but it cost over $300.00 to have it filled. I paid under $ 12.00 for it at Wall-Mart. I will definitely try your other skin products should I need them in the future. This is the best product I have ever used to control my psoriasis. Even better than any prescription strength product I have used. Thanks for a great product!! I went to Walmart to find something, anything to curb the burning itch of my psoriasis. It is mostly on my feet and ankles. I have had it for many years and have tried various cures. The best two until now were Gold Bond Powder and Cortizone Special Psoriasis Formula. For what ever reason they stopped working. I spotted your product on the shelf and decided to give it a try. Wow. Within 2 days the rashes were gone and the itching had greatly subsided. And after three days, I feel like a new man. This stuff really works. Thanks. The Triderma for for psoriasis has been a blessing and has done more to improve my skin than the creams and lotions from my dermatologist! I recommend this product for anyone dealing with eczema/psoriasis. I have had sore, cracked, bleeding and ugly fingers for almost a year. I had to discontinue having my nails done because it was a waste of money when my hands look so awful. Not only were they unattractive to look at, but they were very sore and painful. I have tried everything I can find on the market, as well as anything that someone would suggest to me... Vaseline with gloves on overnight, Working Hands, Aloe products, Oatmeal lotions, "industrial" strength Neutrogena lotions and everything else on the market. While shopping in Target recently and looking at more products for your hands, I came across a tube of Triderma. It came in a 4.2 ounce tube, as well as a purse size, all for $7.49. I decided to try one more product and I have been using it for a month now and my fingers are no longer cracked and bleeding. They are almost healed completely but the box says it takes up to 13 weeks to see that kind of progress. I feel quite sure that I will get to that point. I have used this product daily and overnight for a month and I couldn't be happier with the lotion. But remember it only cost $7.50 at Target. I was disappointed to go online and see the same tube cost $25 online. I can assure you that this product will make a difference to your skin. Give it a try! I have been suffering from Psoriasis in my fingers ... it started long time ago - about 30 years ago with two then 4 then 6 and now I have eight fingers affected by Psoriasis .. four of them are a bit serious and two moderate and two lightly affected.. attacks with blisters used to come in short cycles every 2-3 weeks and stay for three weeks to heal and then after few weeks it comes again and so on. Blisters can be as big as 6-7 even 8 mm in diameter. I started this products about 10 years ago ... with two applications on my fingers twice a day ... morning and before I go to sleep .... it is really not messy to apply ... as it is absorbed within 8-10 min. NOTE : I also use some moisturizer with sea salt two or three times a day.. The results are amazing, frequency is reduced and when it comes it healers faster. I would say at least 70-75% improvement. I am very happy with it and wanted to share my experience with others. Great for sensitive skin. It clears up dryness, rashes and scaly skin. I haven't found anything better! I use this cream on my feet for psoriasis 1-2 times/day and it is very fast-acting and the scaling disappears after 1-2 days of use. Only relief i can find that last longer than 1 day. Just ordered the shampoo! Great product. Fast acting and non greasy. Would definitely recommend this product. Will buy again. I have had psoriasis since my early 20s. This medicine is the only thing that's worked for me. It healed the painful scabs and controls the itch very well. My patches look and feel so much better. It's totally worth the money. My favorite thing is that it's a cream and not an ointment. It absorbs into my skin well to heal. I'm a patient advocate for psoriasis. This product helps me control the itch. I have been diagnosed with severe psoriasis. For stubborn spots I use TriDerma. I have had Psoriatic Arthritis my entire life. I have always been able to keep my skin in check with very little effort. Then last year, I had the psoriasis flare-up of the century. I have never experienced anything like it in my life!! The itching, the rapid spread of the scaling, and the most painful skin I could have ever imagined. My dermatologist prescribed steroids to calm my skin. They worked to some extent but they weren't enough. I heard about TriDerma and thought I'd give it a try. And, what a gift..... TriDerma took the recovery of my skin to a whole new level. It was a very effective tool to add to my daily regimen. I can't imagine going a day without it!! I had numerous spots of white scaly skin that had irritated me for years. The itching just about drove me nuts. I tried your TriDerma Psoriasis Control and could not believe my eyes. Just hours after the first application my spots were reduced by half. On the third day most spots were completely cleared up. I still have a spot on the back of my head and your cream has helped. The itching has totally stopped and the spot has shrunk in size. I bought TriDerma Psoriasis Control cream on a whim. The few other remedies I have used in the past were sold out that day. TriDerma was priced fairly so I thought I'd give it a try. I'm usually quite skeptical when it comes to psoriasis and arthritis products. I've tried many of them. I used Icy Hot, Ben Gay, Capsazin, Blue Emu, et al for my psoriatic arthritis pain and Gold Bond cream, Blue Star Ointment and O'Keefe's Working Man Hand Cream, et al for the dry skin patches. None of the pain creams worked at all and I had very limited success with the skin creams. To say I was pleasantly surprised with TriDerma is a gross understatement. I cannot believe how well this product works! Most of the dry patches on my skin improved with just one application, and the worst patch responded in two applications. Not only do these patches no longer itch or crack, they also are much less unsightly. I use the pool and hot tub at the gym and I was embarrassed by the dry patches. No longer! When someone with psoriasis finds anything that brings any amount of relief to them, they want to tell everyone. I usually don't bother writing to a company, but I was so impressed with TriDerma that I had to let as many people as possible know about this stuff. I'm a customer for life, and I can 't think of any other product about which I would say that! I urge...no, I beg, anyone with psoriasis skin patches to try this product. I guarantee you will not be disappointed. I was about to give up but thought I'd try this product a try. WOW! It actually got my psoriasis under control in a week, and without steroids! I have had psoriasis for over 30 years. Many dermatologists and prescriptions later I have little relief and raised veins on my legs from using topical steroids. I tried Psoriasis Control from TriDerma and viola, the psoriasis is very much improved. It provides immediate relief from redness, itching and scaling. Kudos to TriDerma for having such a great product. Apply generously to affected areas 1 to 4 times daily, or as directed by a doctor. "I've been meaning to contact you for a while now. Your product Psoriasis Control has greatly improved my life. I know that's a big statement but it's true; not only mine but also a friend of mine with whom I shared your product who also suffered greatly from psoriasis. Like me he has psoriasis on his face arms etc. And had limited himself to being in public where people stare and often make comments " what's wrong with you"? Last week I ran into him in a public place with his wife; "this is the first time I've been out in 3 months"! he said and he thanked me so many times for telling him about your product. Ive been using psoriasis control for almost a year now and again, it has changed not only the relief I get but has also made me feel much more comfortable in my social life. Thank you for a product that not only treats a condition, but also improves the users quality of life... that is what you have done for me and I sincerely thank you." - Michael R.
" Satisfaction- results relieves itch quickly and apparent healing. Surprise results! Most OTC creams/lotions don't work as expected. TriDerma works!" - Linda B. "Just want to share with you how well the TriDerma Psorasis product worked! After only 5-6 applications, the scales are completely gone, and the redness is gradually reducing as well. One does not expect miracles, only improvement! I have had this problem since 1964, and now feel a tremendous relief seeing the progress made in such a quick manner! I have been selling products for 35 years that work as advertised , and what a pleasure to experience the results from TriDerma that obviously work as advertised! I just purchased a second tube to have in case the shelves were empty!" - Sammy S.
"My husband is diabetic and has a problem with psorasis and has been on many different prescribed meds (very expensive) and nothing would help until I happeneed to see this. He tried it and it works great. Would recommend it to anyone with psorasis." - Beverly E.
"I have Rheumatoid Arthritis. I broke out with psoriasis as a side effect of a medicine. I have tried everything, TriDerma has really worked. Totally stopped itching and redness. I have finally found something that works. Thank you." - Deborah D.
"I just want to say thank your for the psoriasis cream. It works great! I've used prescription creams in the past and just have not been 100% happy. Within a few days of using the cream, my skin was noticeably less red and less dry. Love your product!!" - Lisa T.